MAIZE’s activities under the different Strategic Initiatives/Flagship Projects are implemented in Asia and Central and West Asia, Latin America and the Caribbean, East and Southern Africa, and West and Central Africa. Maize is the basis for food security in some of the world’s poorest regions in Africa, Asia, and Latin America. Globally, 765 million metric tons of maize was harvested in 2010 from just less than 153 million hectares. About 73 per cent of this area was located in the developing world. Maize is currently produced on nearly 100 million hectares in 125 developing countries and is among the three most widely grown crops in 75 of those countries. The crop provides over 20% of total calories in human diets in 21 countries, and over 30% in 12 countries that are home to a total of more than 310 million people. Production of maize, especially in the tropical regions, is affected by a number of constraints, including an array of abiotic and biotic stresses, poor soil fertility, lack of access to key inputs (especially quality seed and fertilizers), low levels of mechanization, and poor post-harvest management. The result: maize yields in many of the sub-Saharan African countries, where maize is the most important staple food, are often extremely low, averaging approximately 1.5 tons per hectare—about 20% of the average yield in developed countries — and yields in several Asian countries are still below 3 tons per hectare. In addition, one-third of all malnourished children are found in systems where maize is among the top three crops. 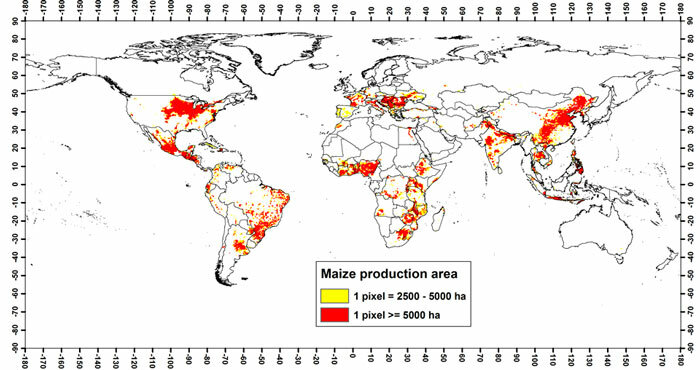 This production map is based on the SPAM data set from IFPRI (Harvest Choice) but has been aggregated from its original format to better represent important production areas. This fits with national statistics from the year 2000, a new updated version is expected to be released sometime this year.